Spurred by inspiring convocation addresses, a slew of new grads are hitting the streets and competing with seasoned professionals. More than ever, the push is on to stand out from the crowd and boost your appeal to prospective employers. Many hiring managers are among 65 per cent of the population classified as “visual” learners. Why not visually profile your brand to catch their attention? You’ll still likely need traditional tools but there are several ways to also visually depict your expertise. 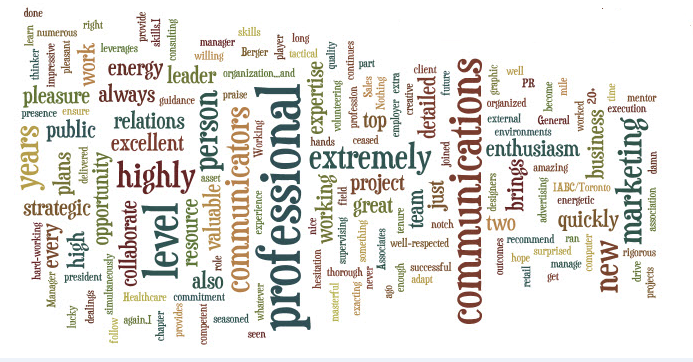 I created this personal branding wordle from references on my LinkedIn profile. Choose from a wealth of free or nominally priced do-it-yourself (DIY) infographic tools, follow a template or adapt an application/social media platform to meet your needs or combine several tactics. 1. ResumUp.com – Provides a template for you to create a comprehensive profile with a: work timeline, skills chart, personality profiles, skills and education summary and preferences. 2. Re.Vu – Enables you to auto create a visual resume with a photo backdrop from your LinkedIn profile. Comes with timeline, stats (revenue generated, events implemented..), and other mix & match options that you can edit, customize or skip. Includes options to upload portfolio/work samples. 3. Vizualize.me (Beta version) – Enables you to create a visual resume from your LinkedIn profile, with a timeline, references, stats and various other mix & match options to edit, customize or skip. 4. Nuzume – This service creates a custom visual resume for $69 and within four business days. 5. About.Me Page: Use this free, intuitive tool, to quickly create a personalized, single page site as a central anchor for your online profile. It can showcase your text bio, photo, social media and other contact links and a range of other plug-ins that tell your story. 6. Personal Website: Showcase your skills in several pages, with portfolio samples and video links, by creating a website using WordPress or a similar platform. 7. Présumé (with Slide Rocket): Select one of Slide Rocket’s “Présumé” templates and customize it to create your own combo presentation and resume. For a basic Presume, just change the text and photo to make it your own, or take it further by embedding photos, video, charts or plug-ins for word definitions and quotes. 8. SlideShare Presentation: Start from scratch to tell your story and value proposition (i.e. how you can uniquely address a potential employer’s pain points) in a PowerPoint presentation. Then post it on SlideShare, a growing social media platform that plugs into LinkedIn and others. Check these innovative SlideShare resume examples from workawesome, many for non-creative roles. 9. Pinterest Resumes: Use this rising social media star as a base to create an innovative resume. 10. Word Graphics: Create a word graphic using Wordle or Tagxedo to depict your breadth of expertise or what others say about you. Copy references from LinkedIn (as I did) by stripping out article words (the, a, in…) and using what’s left as a base. Alternatively, review your past jobs and type the key single word skills used in each, with repetition as required. The resulting graphic shows your more finely-tuned skills/attributes larger than the others. 11. Video: If video is your forte, profile yourself in this medium, as these job seekers have done. You may however want to include a link to a PDF with summary details, as well. 12. Hire a Pro: You can of course always hire a professional like Christopher J. Spurlock to create a resume like his. What have I missed? What’s worked for you or someone you know? < Previous Great Content But Can Your Audience Find You? Next > Why Amputate a Communicator’s Added Value?